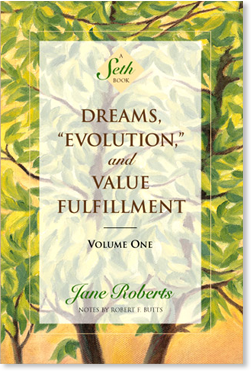 Dreams, "Evolution," and Value Fulfillment, Volume One (eBook) - Amber-Allen Publishing, Inc. In Volume One of Dreams, “Evolution,” and Value Fulfillment, Seth takes us on an odyssey to identify the origins of our universe and our species. He asserts that “consciousness units” form the basis of all energy and matter, and charts a conscious, self-aware universe that is constantly recreated by our own thoughts, dreams, and desires. Illuminating the part that humans play in the greater scheme of things, he suggests that we are alive not only for the continuation of the species, but to add to the very quality of life itself. Volume One describes a conscious, self-aware universe where possibilities and potentials generate life forms. Stimulating and provocative, this book answers crucial questions about the entire significance of Seth’s system of thought, while chronicling the worsening health problems that led to the death of Jane Roberts. Volume Two continues Seth’s explanation of how the physical world is an ongoing self-creation. Seth explains how the human species keeps within its genetic bank millions of characteristics that might be needed in various contingencies, and how the soul employs both physical handicaps and advantages as springboards for further achievement. Seth also expands upon his vision of a thoroughly animate universe where virtually every possibility is not only implicit, but constantly encouraged to achieve its highest potential. Whenever science or religion seeks the origin of the universe, they search for it in the past. The universe is being created now. Creation occurs in each moment, in your terms. The illusion of time itself is being created now. It is therefore somewhat futile to look for the origins of the universe by using a time scheme that is in itself, at the very least, highly relative. Your now, or present moment, is a psychological platform. It seems that the universe began with an initial burst of energy of some kind (“the big bang”). Evolutionist cannot account for its cause. Many religious people believe that a god exists in a larger dimension of reality, and that he created the universe while being himself outside of it. He set it into motion. Many individuals, following either persuasion, believe that regardless of its source, the [universe] must run out of energy. Established science is quite certain that no energy can now be created or destroyed, but only transformed (as stated in the first law of thermodynamics). Science sees energy and matter as being basically the same thing, appearing differently under varying circumstances. In certain terms, science and religion are both dealing with the idea of an objectively created universe. Either God “made it,” or physical matter, in some unexplained manner, was formed after an initial explosion of energy, and consciousness emerged from that initially dead matter in a way yet to be explained. Instead, consciousness formed matter. As I have said before, each atom and molecule has its own consciousness. Consciousness and matter and energy are one, but consciousness initiates the transformation of energy into matter. In those terms, the “beginning” of your universe was a triumph in the expansion of consciousness, as it learned to translate itself into physical form. The universe emerged into actuality in the same way, but to a different degree, that any idea emerges from what you think of as subjectivity into physical expression. The consciousness of each reader of this book existed before the universe was formed (in your terms) but that consciousness was unmanifest. Your closest approximation — and it is an approximation only — of the state of being that existed before the universe was formed is the dream state. In that state before the beginning, your consciousness existed free of space and time, aware of immense probabilities. This is extremely difficult to verbalize, yet it is very important that such an attempt be made. Your consciousness is part of an infinitely original creative process.